Acid Reflux occurs when acid flows from the stomach into the esophagus. Although initially merely irritating at worst, if not treated, acid reflux symptoms can become disruptive and a serious health risk. For acid reflux treatment, homeopathy is a go-to for most nutritionists, as it attacks the most likely cause of reflux. Homeopathic treatments follow a dietary approach. The alkaline diet recommended for homeopathic treatment of acid reflux not only has no known side effects, but it also provides many other health benefits, including being anti-carcinogenic. As mentioned, there are many health benefits from an alkaline diet, so it’s no surprise to learn that the foods we know are bad for us shouldn’t be indulged in. • Avoid dairy and eggs. Foods that help with acid reflux include most vegetables, fruit, legumes, and nuts. Although some vegetables and fruits are considered better than others, providing they are pure and not processed, nearly all-natural plant-based foods will help. Not all mineral water is highly alkaline. If acid reflux is a serious problem, it’s worth investing in an alkaline filter for your water, which is one of the cheapest ways of ensuring water is alkaline. Alkaline mineral water can also be purchased, usually at health shops. It’s sometimes confusing what is acidic and what is alkaline. Ph strips can be purchased at chemists and some health food stores and can help you determine if your body is alkaline. Don’t Let Symptoms Get Worse! 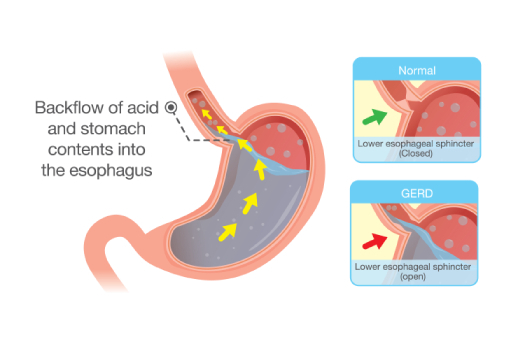 If symptoms become prolonged and severe, acid reflux can develop into gastroesophageal reflux disease (GERD). The muscles of the esophagus may be permanently affected, and the only option for treatment is costly surgery. If tackled early, lifestyle changes can help acid reflux symptoms almost immediately. The qualified nutritionists at Spineplus chiropractic can help you with a diet plan and supplements to reduce the effects of acid reflux.